Looking for a practical gift idea this holiday season? 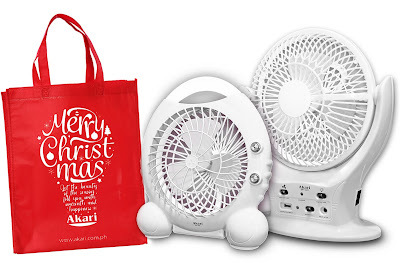 Akari, the country’s top lighting and electrical brand, offers a buy-one-get-one promo on its portable rechargeable fans, exclusively available in Ace Hardware stores nationwide. The bundle promo also comes with a free Christmas eco bag. Purchase the Akari 6-inch LED Rechargeable Cooling Fan for only Php 999.75 and get another rechargeable fan valued at Php 799.75 for free! These rechargeable cooling fans are must-haves during camping trips with family and friends, at home when there is a power outage, or even for everyday use. To know more, visit www.akari.com.ph or Facebook page, www.facebook.com/AkariLights.